Do those green drinks out there intimidate you? 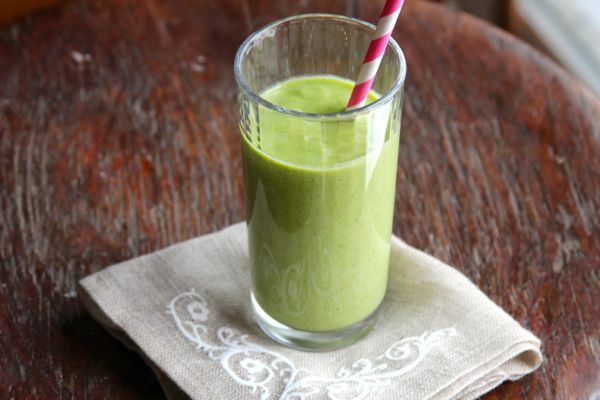 Try this nutritious and delicious Virgin Green Smoothie and jump on the green smoothie bandwagon. Green drinks and smoothies are all the rage and for very good reasons. 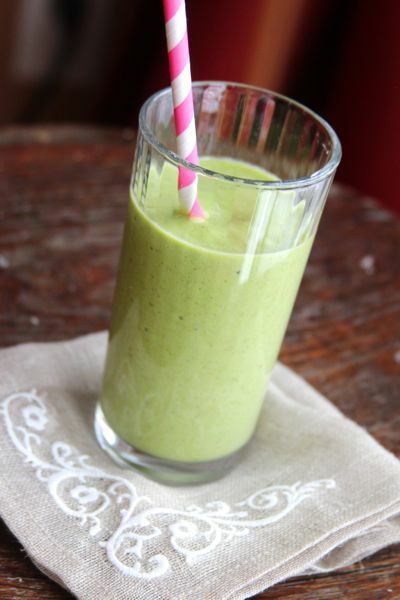 Here are Recipe Rebuild’s top 10 reasons to drinks green smoothies! 1. Drinking green smoothies is an easy way to incorporate healthy fruits and vegetables, especially those dark, leafy greens. 2. Greens are super rich in vitamins and minerals and they contain powerful antioxidants. Greens are loaded with amino acids (protein), and as a bonus are low in calories. 3. Blending fruits and vegetables together breaks down the cells of plants and makes nutrients easy for the body to assimilate. 4. Green smoothies are made using the whole fruit/vegetable, so you get all that great and much needed fiber in one drink. 5. Green smoothies are high in antioxidants and phytonutrients giving your body the best defense against diseases and illness. 6. Green smoothies are thick and creamy and may help us feel fuller thereby decreasing cravings. 7. Green smoothies are the only way I can get my kids to actually enjoy spinach! 8. Green Smoothies are easy to make and taste amazing! 9. Green smoothies are rich with chlorophyll, which some natural health experts say enhances the immune system. 10. Other possible reasons: weight loss, healthier skin, hair and nails, mental clarity, energy, increase immunity, balance pH and double the human capacity of efficiency and productivity (just kidding – but reading the testimonies out there one would think green smoothies might indeed lead to the creation of super humans)! Spinach is high in disease fighting antioxidants and phytonutrients. Spinach is also an excellent source of other antioxidant nutrients including vitamin C, vitamin E, beta-carotene, and manganese, as well as a very good source of the antioxidant zinc and a good source of the antioxidant selenium. Pineapple is high in vitamin C and fiber. It’s also high in manganese, an important mineral for the body’s muscle tone, nerve and bone health. Pineapple also contains the enzyme bromelin, which breaks down protein and may aid in digestion and even help the body heal. Flaxseeds are high in fiber and omega-3 fatty acids, as well as phytochemicals called lignans. Avocados are packed full of vitamin K, dietary fiber, potassium, folic acid, vitamin B6 and vitamin C.
Place pineapple, avocado, protein powder, spinach leaves and flax seeds in a blender. Add the water and blend well until smooth and creamy. Add additional tablespoons of water if needed. Pour into a large glass and enjoy while you slowly transform into a super human!